So I was thinking about yesterday's post about the Gayatri Mantra, and I realized what I wrote might sound a little out-there woo-woo to those of you unfamiliar with the practice of mantra or chanting. For example, "What distinguishes mantra from prayer is that the sound and vibrations of the sanskrit have benefit in their own right of calming the nervous system and lightening the spirit." For reals?! Yes! Here's a very simple exercise that you can do with the simplest sanskrit sound. OM in itself has no literal meaning. It could be described as the sound of the universe, the sound of everything ever at once, the sound of God, the universal vibration, or any number of other things. Chanting OM is grounding, calming, enlightening, and if you're practicing with others, it can unite energy. The sound of OM is actually three parts. Try sounding each one separately and pay attention to what is happening in your body and in particularly, how the sound feels as it reverberates around. Here we go! AAHH is pronounced with your throat open. Notice how the sound comes from your belly, deep within your body. OOOH is generated as you begin to close your mouth. Notice the sound float up to your throat. MMMM is the final piece as your jaw is relaxed but your lips are closed. Notice the sound buzzing around your head. The sound and vibrations move from the ground up, elevating the spirit and calming the mind. Moving from the individual to the universal/spiritual/transcendental. OM anytime! It doesn't have to be just before or after an asana practice! 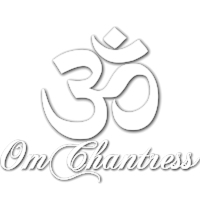 My favorite place to OM is in the car when I am running late or stuck in traffic, or if I'm nervous before a performance a few good OMs will help get me grounded. But if you found your way to this site, you may have already figured out that I'm partial to a good OM!